Published: Jan. 9, 2014 at 10:12 a.m. 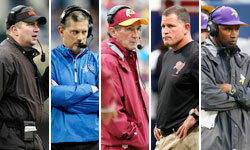 Updated: Jan. 9, 2014 at 04:18 p.m.
With Jay Gruden on his way to the Washington Redskins, the Cincinnati Bengals weren't without an offensive coordinator for long. NFL Media's Steve Wyche reported Thursday that Hue Jackson will take over the team's play-calling duties, per a team source. It's a move that makes plenty of sense. Jackson is on his second run with the Bengals after a one-year stint as head coach of the Oakland Raiders. He previously served as wide receivers coach for Cincinnati from 2004 to 2006, a role that brought him credit for helping to develop Chad Johnson and T.J. Houshmandzadeh. Jackson also served as offensive coordinator for the Atlanta Falcons in 2007 and for the Raiders in 2010, before he was named their head coach. Jackson is an underrated, edgy mapper of strategy who arguably dials up a better game than Gruden. Some of his best work came in Oakland, when helped the Raiders get off to a 4-2 start in 2011 before Jason Campbell was lost for the season, giving way to Jackson's biggest blunder there -- an ill-fated trade for Carson Palmer. Good news for Cincy? Jackson's elevation to OC wouldn't disrupt an offense that came six points shy of becoming the first team in NFL history to score 40-plus in five consecutive home games. UPDATE:The Bengals announced Jackson as the team's offensive coordinator, per Cincinnati's official Twitter account.